These resources will help you find additional procurement opportunities and connect you to technical assistance providers who can help you bid successfully. Procurement Services is New York's central procurement office, responsible for establishing and managing contracts for core goods and services needed by government entities across the State, including state agencies, local governments, and other authorized users. Visit the NYS Office of the State Comptroller's website to learn more about Vendor Responsibility (VendRep system), how to obtain a Vendor I.D. number and other information related to New York State's procurement process. If you are a Minority or Woman owned business, interested in bidding on New York State procurement opportunities, you may want to apply for certification as a NYS Certified Minority or Woman Owned Business Enterprise. If you are a Veteran business owner with a service-connected disability rating of 10% or more, you may be eligible to become a NYS Certified Service-Disabled Veteran-Owned Business (SDVOB). Please consider applying for certification and helping New York State reach its goal of increasing SDVOB participation in State contracting opportunities. 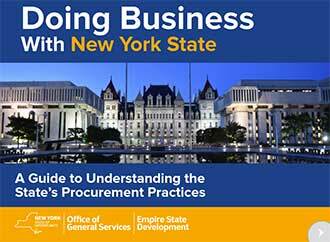 Learn more about state purchasing from this guide to New York State's procurement process: Doing Business with New York State. Information to help suppliers, consultants and contractors identify solicitations on which they would like to bid or make a proposal. Learn how to bid on New York City contracts for goods, services and construction. Learn how to bid on federal government contracts for good, services and technology. Receive financial, management, marketing and other business advisory technical assistance for your business from the center closest to you. MERX is Canada's official public sector electronic tendering service that provides businesses the chance to bid on billions of dollars of contracting opportunities annually. PTAC's provide businesses with assistance in marketing products and services to the Federal government as well as state and local governments. They can also help you become a more successful bidder on government contracts. NASPO is an organization of member through which purchasing officials from all 50 states, the District of Columbia and U.S. Territories provide leadership in professional public procurement, improve the quality of procurement, exchange information and cooperate to attain greater efficiency, economy, and customer satisfaction.